Once I was on my bipolar meds, I felt much more stable and I made a solid plan to pay off our debt and get our finances under control. Our income varies greatly from week to week and even month to month, and all of the traditional budgets I'd tried wouldn't work for us. After looking around the internet, I found what was called a "Zero Sum Budget". I explained all of the details about it on that post, but here is the gist: We calculated exactly how much money we need each month to pay all of our bills + food + gas + medical + "extras"--and that is our "bare bones" budget. (We actually included our allowances in there, too.) That bare bones number is the exact amount we need in order to pay for all of those things. So, we start each month with our "bare bones" amount--no more. We use that money to pay for all that we need during the month. Meanwhile, the money that we are earning through the month is accumulating to use for the following month's budget. Any money that we earn on TOP of the bare bones figure goes toward paying off the credit card debt. Let's say that our bare bones budget is $3500, and we earn $4500. We set aside $3500 for the following month, and then we apply the extra $1000 to the debt. This post explains it better, with real figures. Anyway, once I learned about this method, I thought it sounded perfect for us. I loved the idea of starting the month with all the money we'd need! I wouldn't have to worry about living paycheck to paycheck. We (luckily) just so happened to start the budget right when we had an unusually high income month. It worked out perfectly because we had just enough money to start June with our bare bones budget. (When you're already in debt, it's hard to come up with a whole month's worth of money to start with). The first thing I did was apply for a 0% interest credit card with no transfer fee. I was able to transfer our debt to the card and pay 0% interest for 18 months! I also decided to take advantage of credit card rewards (it's at the bottom of this post)--this method isn't for everyone, because it can actually acquire a lot more debt if you're not disciplined. But it's the way we do things and it has worked out really well for us. We started giving ourselves a monthly allowance (spending money for each Jerry, the kids, and me). Our allowance was for things that we wanted but that didn't fit into the budget. We can spend our allowance on anything we want, which makes it easier to stick with the budget. It has also made the kids learn to be wise with their money, since we aren't buying them things anymore (other than their needs, of course). Okay, so that was our basic debt repayment plan. In June 2017, looking at the number $14,500 made it seem impossible that we'd ever get it paid off. 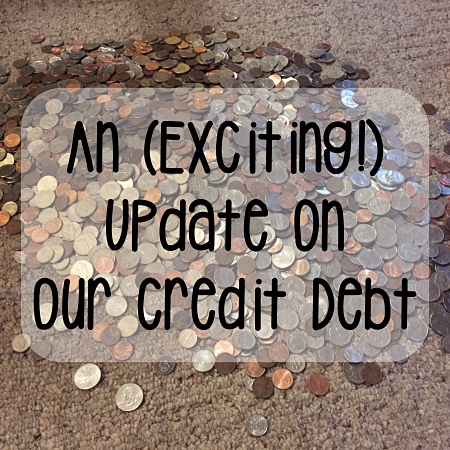 As of this morning, we are now 100% credit debt-free!!!! It took us 14 months to pay it off, and I am still in disbelief. I made the last payment this morning when my paycheck was deposited into the bank, and then I just sat back and waited for it to hit me. We don't have any credit card debt! The only things we owe money on now are the Jeep and the house. I never thought we'd get here. There were several months where we went over our bare bones budget due to unexpected expenses that came up, but we kept it as minimal as possible. We never had a month where we spent more than we earned, though (i.e. accumulated more debt). Right now, I'm just in disbelief. What started out as a pipe dream just 14 months ago is now reality. WE DID IT!!!! Congrats! That is huge! I was going to be able to pay off all of my debt except for my car loan by the end of next month, but my dog needed an emergency surgery last week that means it will probably take an extra couple of months to fully pay everything off. I still hope I can be completely debt free by the end of the year. I paid off my student loans in full last month, and that was a huge thing. Congratulations, Katie!! That's awesome!! I'm soooo thrilled for you! Woohoo!! Congrats! That's so exciting! Congratulations! That is really something to be proud of. Wow....that is great!! So many people get caught up in credit card debt and I am sure they think there is no way out but YOU DID IT!! Huge Accomplishment!! Congrats Katie! We are Working on getting out of debt as well. I recommend you check out dave Ramsey for after (or before)you get out of debt and follow his plan to build your wealth for a comfortable retirement. You basically already follow his principles with money. Since you like audiobooks you should listen to the total money makeover . Changed my life because I have a good plan now! That is a big deal! Congratulations and good work you guys! Congrats, that's a huge achievement! With the same approach you could be "FI" financially independent" in a few short years, without ANY debt...you go girl! Congratulations! You should be proud of yourself. You and your family are so disciplined with your spending - so many people work to get out of debt and never get there. Congratulations! When I finally got my debt paid off, I felt so much relief, and excitement, it is the BEST, good for you! The other thing I felt, though, was: NEVER AGAIN. Barring something you really can't control like a medical emergency, I will never voluntarily do that to myself again. ENJOY! Congratulations! That is a huge achievement! I have a question about your allowance system - I've been thinking for a while that I would like to adopt it. Our family doesn't use cash much at all - My husband would go to the ATM once a month to get $ for the kids allowances but then he'd need to buy like a pack of gum to get change to give them their allowance. And he likes to buy craft beer but always puts it on the ATM - A cash allowance would hopefully help real him in in that department. But I keep thinking of what I would use my allowance for. 1 thing would be buying lunch at work (but I don't want to be doing that). I also figure I could use it towards Kindle books and a few other things I get on-line. but then I don't need cash for those - but I feel like I need to be as accountable as the rest of my family on my spending. But so much of what I buy is for the family, but some of it is completely unnecessary, but I also don't want to use all my allowance to buy family items! So I am the main reason I haven't started this! But I would like to do it starting in September - new school year, new budget.